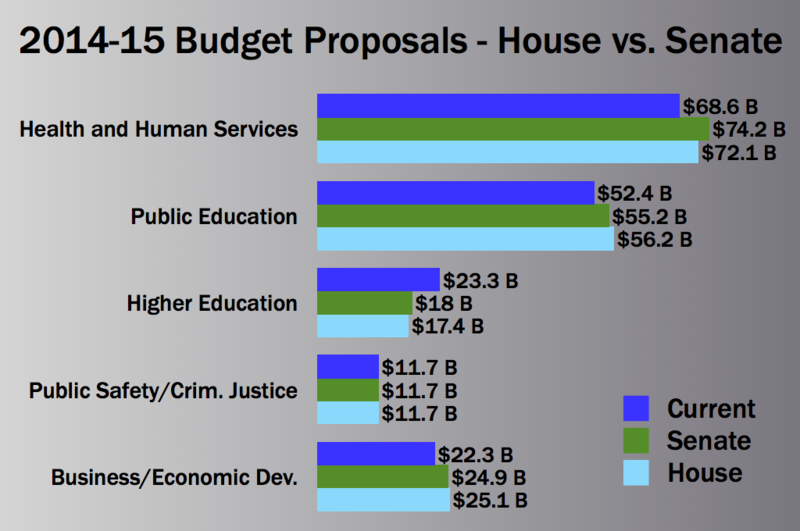 Both the House and Senate are proposing spending about $194 billion over the next two years. But there are key differences between the two plans. "Our bill does not include cost growth, does not include rate increases, and we need to address those things," state Rep. Jim Pitts, R-Waxahachie and the chamber’s chief budget writer, said last week. 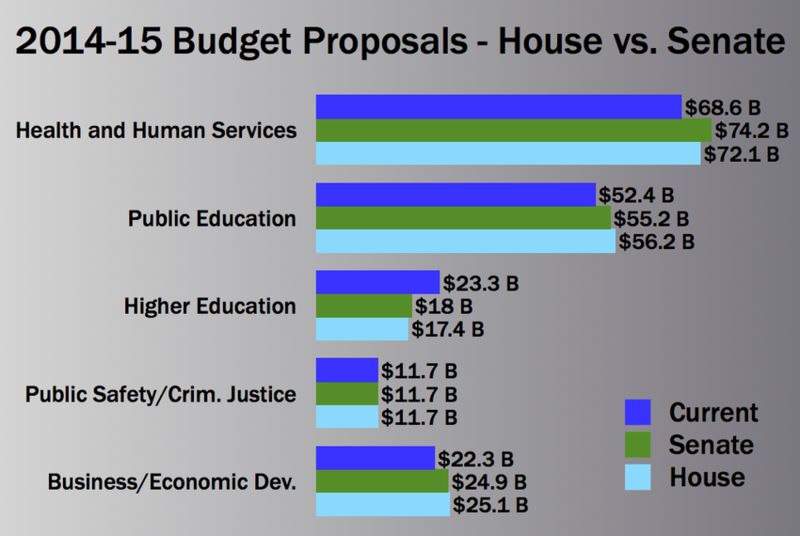 Below is a graph showing how the two plans fare on the five largest parts of the Texas budget. 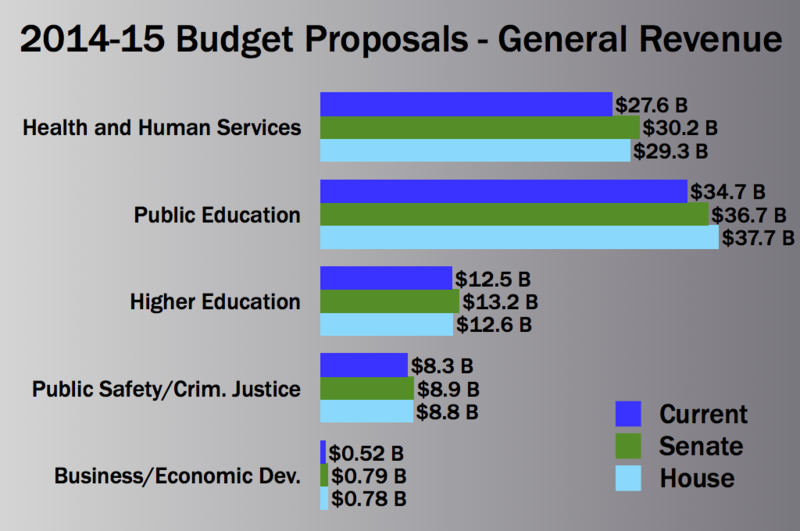 The five areas — health and human services, public education, higher education, public safety and criminal justice, and business and economic development – make up more than 90 percent of the proposed budgets. The data is from the Legislative Budget Board. One note: The higher education portion of the above graph is misleading. This session, lawmakers ended a long-standing practice of including in the budget patient income from health-related higher education institutions. Moving that income "off the books" removed $6.1 billion in higher education spending from the House and Senate proposals, which makes it appear that spending is being cut. It is not. In fact, both proposals increase funding for higher education. And here is a graph showing how the two plans measure up in terms of general revenue, the portion of the budget that state lawmakers have the most control over. Overall, the Senate budget spends $94.1 billion in general revenue, $600 million more than the House budget. General revenue typically makes up roughly half of the state budget.